CEM Connections - Group at San Francisco, homeward bound. Group at San Francisco, homeward bound. 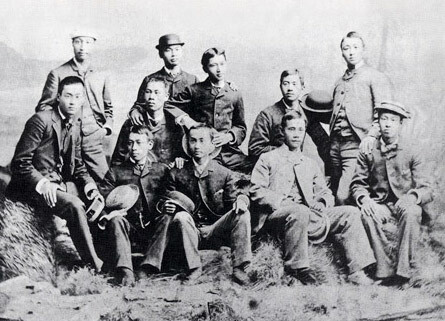 In August 1881, this group of young men (all Yale students) posed for a studio picture in San Francisco where they stayed over for several days during their journey back to China. Front row, L. to R.: Liang Tun Yen, Ouyang King, Chung Mun Yew, Luk Wing Chuan, Liu Chia Chew; Back row, L. to R.: Chun Kee Young, Chang Hon Yen, Jeme Tien Yau(wearing hat), Chun Pay Hu, Kee Tsu Yi, Wong Kai Kah.